Introduction - General Swcharzkopf’s Reaction to Pleime Counteroffensive into Chupong-Iadrang Complex’s operational concept. I'd never heard anything like this at West Point. I was thinking, "What's all this about eight o'clock and eleven o'clock? How can he schedule a battle that way? As a matter of fact, it's not an extraordinary operational concept as far as General Hieu is concerned at all. Furthermore, he considered this Eagle-Darting-Down-From-The-Sky tactic to catch the prey was only effective if the prey was a slow-moving lamb, but became ineffective if the prey were quick-to-run-into-the-bushes Vietcong foxes. He learned through experiences that the tandem Infantry-Armor formula was more suitable to the Vietnam battlegrounds, and proved to be more effective in rounding up the ever evasive Vietcong foxes. That was why as soon as he took command of the 5th Division, according to the ARVN 5th Division's Senior Advisor, John Hayes, General Hieu immediately converted the Armor Cavalry Regiment from the role of "Palace Guards" into a fierce instrument of attack. Prior to bringing in General Hieu to the 5th Division, General Tri, a former paratrooper, used exclusively the "Plunging Eagles" tactic in rapidly discharging and picking up small teams of paratroopers, and was able to establish an impressive record of numerous but then small victories. Initially this tactic seemed successful, but was soon neutralized by those seasoned Vietcong foxes that would disperse and vanish into the bushes as soon as the helicopters appeared on the horizon. And so, General Tri tilted toward General Hieu's idea and switched tactics into using more often the "round up" tactic, using the tandem Infantry-Armor formula, especially in crossover border operations. - the second one in herding three regiments in a vast Chupong-Iadrang complex area stretching from Pleime camp to Chupong massif through the proxy of US 1st Air Cavalry Division. In order to execute the operational concept as planned the pre-requisite of its success was the capability of knowing exactly the precise moment and the location when the three regiments close in, not before and not after, in order to become suitable targets for B52 strikes. Colonel Hieu had that capability. He could pinpoint the movements of the three regimental headquarters on their convergence paths to Chupong-Iadrang complex, when they were on the move and when they paused, oftentimes he even knew what their cadres were doing: meeting to resolve the spies case, counting the noses, assessing the losses, planning sessions for a second attack, reorganizing combat units, training and rehearsals, setting attack D-day, attack readiness status, assembling location, staging location, dispersing time. He had at his disposition different intelligence sources: Eagle Flights and Airborne Rangers recon teams, prisoners/ralliers/deserters’confessions and testimonies, radio intercepts. Plus radar and infra-red reports from aerial surveillance and target acquisition platoon and Radio Research Unit from 1st Air Cavalry. Among those intelligence sources radio intercepts of communication between Chinese Advisors at regimental and divisional levels was the main key to on real time intelligence knowledge. He only knew what the Chinese Advisors discussed in their communications, and they discussed a lot, almost everything... When they stopped talking, he had to rely on other less on real time intelligence reports from other sources. When asked by 1st Air Cav Intelligence folks how G2/ II Corps was able to get intelligence so precise to the point the enemy suspect internal spies, the response was “we have special agents”. Those unintentional “special agents” were none other than the Chinese Advisors who discussed freely and openly among themselves on everything: logistics, locations, troop morale, cadres’ intentions and plans, order of battle, etc. Montgomery was constantly defeated by the foxy Rommel until the day his intelligence succeeded in cracking the German code and defeated the mighty Rommel in the Sahara desert because he was able to intercept and decipher radio communication from German’s units. It's a strike of sheer luck that Colonel Hieu was able to acquire such solid intelligence in the execution of his operational concept. Without that is was certainly doomed to failure. Ergo, it is quasi impossible to duplicate this feat: herding three regiments into one location and destroying them with B52 strikes. The battle from phases 2 and 3 also introduced an aspect never seen up to now because for almost 20 years, during the Franco-Vietnamese war, seldom pursuit operation was considered after each time the enemy made appearance and when it was conducted, no significant results had been achieved. Therefore this time around, the determination not to allow the enemy to escape, coupled with the solid intelligence on the enemy situation had permitted the battle to develop to maximum degree and scale and at the same token lead to the biggest victory ever achieved by the ARVN and its Allied. 2. Herding the Enemy Troops to Chupong-Iadrang Complex. "Herding the enemy troops?! Never heard of such thing at West Point!" The initial mission assigned to 1st Air Cavalry Brigade in phase 2 of Pleime campaign was the pursuit of the two 32nd and 33rd Regiments on the retreat march back to Chupong-Iadrang complex, “search and destroy” the enemy in operation All the Way. But it soon became a “herding” operation, aiming at canalizing, at rounding-up the scattered troop units to a common location for the purpose of destroying them more efficiently with B-52 strikes. To these days, everybody, even the high ranking American officers who was directly or indirectly involved in carrying out this operation and the Vietnam War scholars and historians, thought that the operational concept consisted in “searching the enemy, fixing them, then destroying them with air assaults”. If that was correct then the 1st Air Cavalry did not harvest much result. The Air Cavalry forces only engaged the enemy troops four times (Why Pleime, chapter V): one 11/1, at the 33rd Regiment field hospital, enemy casualties: 299 KIA and WIA, 44 CIA; on 11/3, ambushing the 8th Battalion/66th Regiment in Chu Pong, enemy casualties: 312 KIA; on 11/6, engaging the 6th Battalion/33rd Regiment at Ia Meur river, enemy casualties: 477 KIA and WIA; on 11/14, engaging the two 7th and 9th Battalions of 66th Regiment at LZ X-Ray, enemy casualties: about 1800 KIA, 6 CIA; on 11/17, engaging the 8th Battalion/66th Regiment and the 1st Battalion/33rd Regiment at LZ Albany, enemy casualties: 503 KIA. After the 1st Brigade battalions generally lost contact with the remnants of the 33rd Regiment on November 7, Kinnard said, in Army Magazine, that, “I had been planning to replace the gallant, but spent, First Brigade with the Third Brigade, commanded by Colonel Thomas W. Brown, and this seemed a logical time to do so.” The general might have been indulging in a bit of hyperbole. The units of the 1st Brigade unquestionably were gallant, but spent? The 2/12 Cav had spent the longest period in the field, eighteen days total – but its days in contact numbered about five. The 2/8 had fourteen days in the valley and only two days of hard contact. The 1/8 Cav’s one company had one day of contact, while the others had none. And the 1/12 Cav had only its reconnaissance platoon truly get shot at in anger. Compared to times in the field by units later in the war, this was a walk in the park. That day - November 12 - General Larsen was visiting the division’s forward command post at the II Corps compound. He asked Knowles how things were going. Knowles briefed him on the attack on Catecka the night before and then told him the brigade was drilling a dry hole out east of Plei Me. Larsen said, “Why are you conducting operations there if it’s dry?” Knowles’s response was, “With all due respect, sir, that’s what your order in writing directed us to do.” Larsen responded that the cavalry’s primary mission was to “find the enemy and go after him.” Shortly after, Knowles visited Brown at the 3rd Brigade command post and told him to come up with a plan for an air assault operation near the foot of the Chu Pongs. In the second phase of Pleime campaign that the American side called Long Reach operation initially and Pleiku campaign afterward, Colonel Hieu – through General Larsen – was in control, General Kinnard and General Knowles were in command. At the time of the Xray fight, Swede Larsen was under pressure from the news media on why we left the battlefield. They didn't understand how our unit fought. With an air assault unit, we don't give much of a damn about terrain. You can go anywhere. The focus is on the enemy. You go where he is. At Xray, the enemy broke off, we didn't quit. We were no longer interested in Xray. That piece of ground meant nothing to me. I wanted to go on to where the enemy was. But Swede ordered me to stay in that spot, and I stayed there an extra 24 hours. - 08:20H: II Corps Capt Ushijima - Who if anyone at Pleiku can make a Cmd decision if necessary in Vinh Loc's absence? Request you stay on top of Than Phong 6, Plei My and route 21 Opns and ensure timely and accurate info forwarded this HQ. Asn: Chief of Staff is here and has contact w/CG on coast. Question: Can CofS make a decision? Ans: He will have to check w/CG before making a decision. General Larsen progressively came to appreciate Colonel Hieu’s insights and command skills during the Pleime camp rescue operation and consequently agreed wholeheartedly with Colonel Hieu’s operational concept in the Pleime Counteroffensive into Chupong-Iadrang Complex. Of course, Colonel Hieu was shrewd enough to hide behind General Vinh Loc in his dealing with all the American military big shots. He was one of a kind chief of staff, wasn't he?! Later on, Colonel Hieu was assigned to lead the 22nd Infantry Division and continued to have the chance to work closely with General Larsen at first then with General Peers, Larsen's replacement at IFFV. “a battalion of 120mm mortars and a battalion of 14.5 mm twin-barrel anti-aircraft guns which were both en route down the infiltration trail and scheduled to arrive in time for the attack”. “Field Front units convergent to assembling areas for preparations and rehearsal for the scheduled attack on Pleime”. “Field Front forces began staging in the Chu Pong-Ia Drang area in preparation for movement to Pleime and the projected 16 November attack. Some recon parties and transportation units already had moved out”. It was time to call in B-52 air strikes. However, in order to induce the B3 Field Front Command to prolong the holding of troops at their respective staging areas, Colonel Hieu devised a distractive diversionary move with the insertion of one 1st Air Cavalry “at 3 kilometers northeast Chu Pong, 200 meters from the location of the 9th Battalion 66th Regiment” (General Huu An) on 11/14. Upon seeing the insertion of 1/7 Air Cavalry Battalion at LZ X-Ray, B3 Field Front “issued an order to delay the attack of Chu Ho,” and refocused its attention toward attacking the new found enemy unit. In so doing, it kept its troop units concentrated at their respective staging areas. Another reason for the choice of 11/14 for the insertion of 1/7th Air Cavalry Battalion was to avoid the deadly firepower of 14.5 mm anti-aircraft guns that would have shot down all the troop transport helicopters and of the 120 mm mortars that would have decimated ground troops prior to enemy assaults. The 1/7th Air Cavalry Battalion’s main mission was to distract the enemy and stay put as a blocking position. If the enemy decided to remain in place, then fine and the better for B-52 strikes. If he decided to attack, then hold the line to allow B-52 strikes where supposed to. 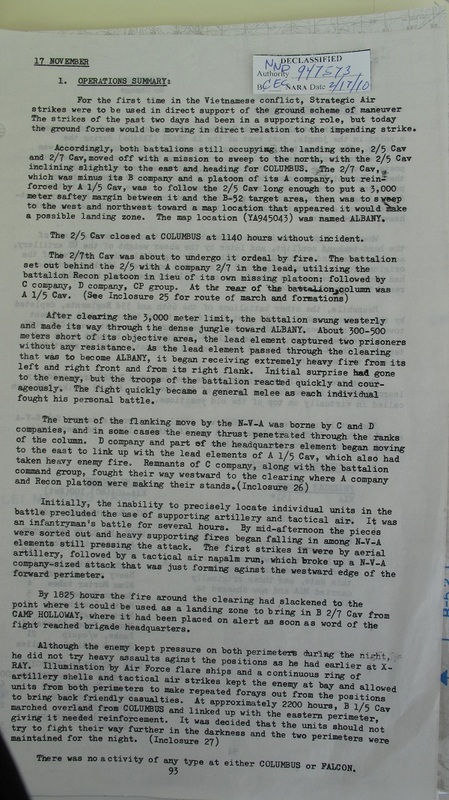 When only the 9th Battalion/66th Regiment made the engagement, only one 1st Air Cavalry Battalion, the 2/7th, was sent in as reinforcement, instead of applying the pile-up tactic in committing more troop units, so that not to make B3 Field Front rush in the 32d and 33rd Regiments, which would jeopardize the use of B-52 air strikes, with friendly and enemy troops too closed to each other. When B3 Field Front committed an additional battalion (the 7th/66th Regiment), the 2/5th Air Cavalry Battalion was dispatched into LZ X-Ray by marching by foot from LZ Victor, undetected by the enemy. On 11/17, the two air cav battalions were ordered to abandon the LZ X-Ray, to allow B-52 targeting the landing zone itself. It was a routine operation, in so far as any operation deep in enemy territory can be routine. - Starting 10/27, herding the scattered 32nd and 33rd troop units toward Chupong-Iadrang complex with operation All the Way conducted by 1st Air Cavalry Brigade. General Knowles thought it was a search and destroy operation. - Starting 11/8, enticement diversionary move by switching the operational direction from west to east with operation Bayonet I conducted by 3rd Air Cavalry Brigade. General Knowles still thought it was a search and destroy operation. He was disappointed because the operation drilled into dry holes. - Starting 11/14, distracting diversionary move by inserting the 1/7th Air Cavalry Battalion at the Chu Pong footsteps. LTC Hal Moore thought he was conducting a routine search and destroy operation. For five consecutive days, from 15 to 19 November, the giant B52 bombers had flown a total of 96 sorties. 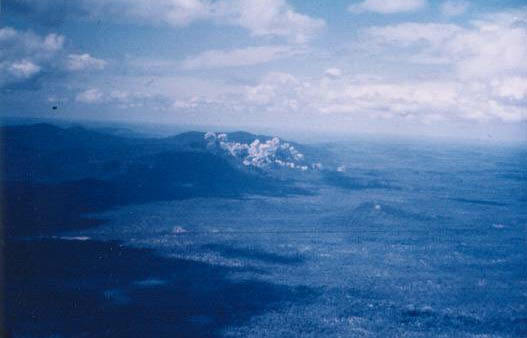 One after the other, the areas of the Chu Pong massif - each of 20 square miles - underwent a systematic earthquake spreading from West to East. VC bunkers and trenches which so far had resisted the strikes by tactical aircraft and artillery began to score direct hits by the 750-pound bombs. The heavy canopy of the jungle ceased to be effective in both concealment and cover. The "back door" into Cambodia was closed and to escape, the VC remnants were reduced to utilize the narrow valley of the Ia Drang. = Who did the stalking? Colonel Hieu. = Who gave the green light signals for each of the four – herding, enticement, distractive, B-52 air strikes – maneuvers to start? Colonel Hieu. For the first time in the Vietnamese conflict, Strategic Air strikes were to be used in direct support of the ground scheme of maneuver. The strikes of the past two days had been in a supporting role, but today the ground forces would be moving in direct relation to the impending strike. General Kinnard’s misconception is an indication that the operational concept of Pleime counteroffensive into Chupong-Iadrang complex originated from II Corps Command rather than from 1st Air Cavalry Division Command. Side bar: The success achieved by the execution of this operational concept in the case of Pleime Counteroffensive demonstrated that a clear knowledge of that concept does not have to be imparted to the commanders of various levels from top to bottom. It only necessitates that the person who conceives the concept knows the proper use of each of the combat units that take part in the operation. Only the top person has to think, the rest just execute according to their respective abilities without a need for thinking. So it did not matter that much when LTC Hal Moore was put in a situation where he did not have time to think, just to react as he was trained. II Corps Command thought it was time to throw in the reserve in order to put an end to the battle which had lasted for about one month. Besides suffering heavy losses, the enemy was compelled to fall into the trap set by friendly forces and canalized into the routes of withdrawal which we had foreseen. This time the main effort was conducted by the ARVN Airborne Brigade whose mission consisted of destroying the fleeing VC units and all their installations around the Ia Drang valley. The 1st Air Cavalry Division which had thus far borne the burden of the attack would continue to exert a pressure from East to West and to provide artillery support for the Airborne Brigade. The operation - dubbed "Thần Phong 7" - began in the afternoon, 18 November when the brigade was helilifted to the area of operations, immediately upon arrival in Pleiku. 18 November: The 52d Aviation Battalion staged II Corps (ARVN) Operation Than Phong 7 from Duc Co. The 52d elements, ten UH1Ds, twelve UH1Bs and eleven UH1Bs (A) were reinforced by twenty UH1Ds and six UH1Bs (A) from the 229th Avn Bn, 1st Air Cav Div. Fifteen hundred (1500) troops were lifted in five lifts from Duc Co to Landing Zone YA 841092. Two (2) UH1Ds from the 155th Avn Co sustained light damage from ground fire, no injuries. A major factor in the operation was a first for the Battalion in refueling twelve aircraft at a time from prepositioned pods, without shutting the aircraft down. Fwd CP states the elem's in Abn TF area was coordinated at higher levels than Fwd G3. The Abn TF knows about it. After setting up his field headquarters just outside the II Corps command in Pleiku City, Knowles […], he called Kinnard and said, “Hey boss, communications being what they are, we have potential for problems with the setup the way it is. If you and Swede don’t have enough faith in me, then get someone up here who does.” Knowles didn’t have to work hard to convince Kinnard, who was a strong believer in delegating to subordinates. But Kinnard had to convince Larsen that Knowles needed to have the flexibility to operate. This was still very early in the active American involvement in the war, and senior commanders were generally tiptoeing their way into positions of dominance. So Knowles’s orders were amended to read: “Assist the ARVN if called upon to do so, and seek permission if time and communications permit.” Essentially, it was a carte blanche for Knowles. - Colonel Hieu had to put a bridle onto General Knowles’s earnestness in forcing him to be contented with the supportive role of securing Pleiku City. Joint intelligence and support activities, commonly-shared concept of operations and results, separate TAOR, command, deployment of forces, conduct of activities, reserve. to seal off the area in which the guerrillas were fighting, to separate them from their source of reinforcement, supplies, weapons. For a while, Colonel Hieu let General Knowles roamed freely the vast area stretching from Pleime to Chu Pong in the search of the enemy, knowing that he would not be able to seal off that wide expanded 40 km by 50 km area covered by jungles, even with more than 500 helicopters and 3 air cavalry brigades, and that he would not be able to find and catch those quick-to-run-into-the-bushes Vietcong foxes. He did not care that much, he had a better idea to deal with the evasive enemy: stalk them, herd them toward a location, then squash them with B52 air strikes. * Therefore, on 11/8, he made General Knowles turn his head away from the west toward the east, without much explanation. * Then again on 11/12, he turned General Knowles’s head back westward, with an enigmatic explanation: to entice the enemy to attack again. * Then again, without specific explanation – just a routine search and destroy operation, General Knowles was ordered to insert a battalion at the footstep of Chu Pong massif. * On 11/16, General Kinnard wanted to pull immediately his troops out of LZ X-Ray, Colonel Hieu made him stay one day longer in preparation for B52s to strike at the landing zone itself. Colonel Hieu had again to put a bridle onto General Kinnard’s zeal in calling in the ARVN Airborne Brigade that would do a better in a surgical operation than the 1st Air Cavalry. You’ve got to remember that I [General Kinnard] was the only one who had ever commanded an air assault division. (…) Only General Gavin had commanded longer than I.
I knew in a way that no one else did the real capabilities and limitations of an air assault division.